The latest crazy in anything health related lately seems to be coconut oil, and for good reason. Not only can you cook with coconut oil (as a replacedment for butter and other oils) you can also use it to heal skin issues, and more. Below you will find 5 uses for coconut oil that just might make you want to pick up a jar the next time you are at the store or you can score a great deal on coconut oil on Amazon.com. Coconut oil is excellent for rashes. Put pure coconut oil on rashes, itchy skin, or even eczema to help reduce redness and stop the itching almost instantly. Coconut oil is a great dairy substitute. You can replace the butter in many recipes with coconut and can fry foods in coconut oil as well. Many dairy substitutes in the store are made with coconut oil now such as Coconut Butter and Coconut Cream. Coconut oil makes a good baby diaper rash cream. Does your baby get rashes frequently? Put coconut oil on them and not only will it help the rash clear up but it will come back less and less frequently. Add coconut oil to smoothies. Adding a little coconut oil into your smoothies will give them a nice tropical taste and a good antioxidant kick. Make your own toothpaste. Simply mix 2 tablespoons of coconut oil with 2 tablespoons of baking soda and use it as toothpaste. It won’t foam up like store bought toothpastes do (which is just a chemical reaction and not necessary for cleaning teeth) but it will keep your teeth clean and shiny and free from bacteria. 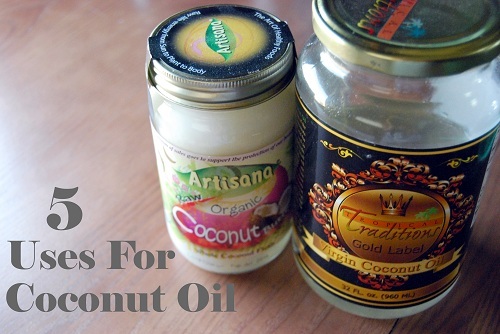 There are many more uses for coconut oil as you will discover if you try some for yourself. Now you can pick up coconut oil online or in just about any grocery or discount store including Walmart, so you should not have any trouble finding any in your town! We use coconut oil for so much in our house. We love it! Also does wonders as a hair conditioner.